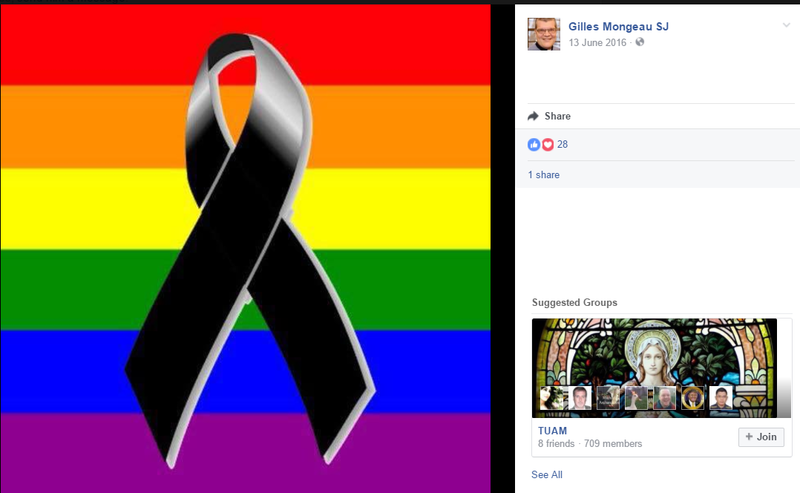 Gilles Mongeau S.J., is a professor of systematic theology at the University of Toronto and a prominent Jesuit dissenter. Readers may wish to review my first post about this this - at times - enigmatic man, who is able to preach two and two is four to one group of people; and two and two is five to another. Indeed, last Fall Fr. Mongeau received umbrage from homosexuals as he presented a series of lectures that - from reports - followed the official Ontario Catholic bishops on the issue of homosexuality. But these presentations at the U of T are but a side show. Those who subvert the Church will do so with subtly, taking two steps forward, one step back, and so on. Like Fr. James Martin S.J., his American counterpart, Fr. Mongeau is a skilled operator, who coats falsehood with fine words and delicacy. The most dangerous Modernists are always those who are the most subtle, mixing truth with falsehood. Fr. Mongeau S. J., is a dangerous man; for behind a thin veneer of orthodoxy, we see a consistent heterodox moral theology. Let us now examine the long history of Fr. Mongeau with the homosexual movement within the Catholic Church. To truly discover who Fr. Mongeau really is, the danger he poses, let us turn to Joseph Sciambra. Mr. Sciambra, once a practising homosexual, before he found Our Lord and Saviour, is an expert on the homosexual movement and its infiltration into the Catholic Church. So insidious, so evil is this infiltration that Joseph was actually repulsed by priests when he sought to reconcile with Christ and abandon his sinful lifestyle. When priests no longer preach openly, clearly, concisely that each and every homosexual act is intrinsically evil, then we have a very, very serious problem of homosexual infiltration. In a very damning and detailed post on Fr. Mongeau S.J., Mr. Sciambra exposes that Mongeau has long been a dissenter regarding homosexuality. Sciambra further points out the origins of "All Inclusive Ministries" (AIM) in the openly dissenting homosexualist group, Dignity. The Bishops certainly in North America decided that the group known as Dignity could no longer meet on Catholic Church premises. 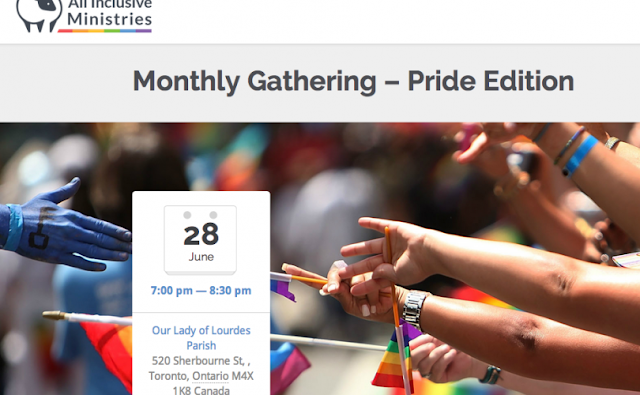 The Archbishop of Toronto at the time, Cardinal Carter, went along with the decision of his peers, but wrote a letter to the pastor of Our Lady of Lourdes, the Jesuit Pastor…asking the Pastor to welcome Dignity for their meetings on parish premises….I think the letter says something like: “in a discrete fashion” or something like that…The idea was we don’t want to cut our ties, we want to continue to minister to this group, but it has to be done in a way that will not publicly contradict the decision I’ve made. According to Mongeau, the “antecedent” or “ancestors” to AIM were Dignity, the Soho Gay Mass in London, England, and AGLO. Mongeau described the Soho Gay Masses, along with AIM, as part of “a new ferment in the Roman Catholic Church.” Yet, in 2013, the Archbishop of Westminster forbade the continuation of the Masses which had taken place for the preceding six years at Our Lady of the Assumption Church in the Soho District of London. Very disturbingly, AIM also openly teaches a favourite of homosexual activists: that homosexuality is actually God's gift to the human race. There are those whose theological project will always be to prove that gay love is something other than love. That proof can never be had. Gay love is love, and if Jesus was correct that the law is summed up in love, then homosexuality is hardly unbiblical. And if the end of natural law is to love rightly and fiercely, homosexuality is hardly immoral or unethical. Fr. Mongeau has NOT rejected these official announcements of AIM, he has not denounced them, he has not resigned his position with them. Yet the above statements of AIM are blasphemous, heretical and will send people to Hell.